With impact drivers becoming more popular every year, it only makes sense that the accessories you use with your impact can hold up to the extra torque that impact drivers offer. The problem is most bits were designed with drills in mind and their much lower torque range. 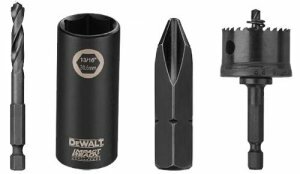 DeWalt saw this problem and has designed and engineered a new line of accessories specifically for impact drivers. IMPACT READY Drill Bits - Patented one-piece, taper web design provides 5x more durability than conventional hex shank drill bits. IMPACT READY Holes Saws - 2x more life than standard bi-metal hole saw when drilling 16g, steel. IMPACT READY Pivot Holders and Nutsetters - locking collar for straight or angled driving, 20 degree pivot angle to complete applications in tight spaces. IMPACT READY Nutsetters - locking collar for straight or angled driving, 20 degree pivot angle to complete applications in tight spaces. Patented, recessed corners distribute torque across flats and eliminate stripping. Offers best in class magnetic strength for increased bit retention with impact drivers and wrenches. IMPACT READY Screw Driving Bits - includes Phillips head, square, and slotted bits, all able to withstand high levels of torque. IMPACT READY Driver Sockets - thinner than wrench sockets for tough access areas. So the next time you are looking for impact accessories, you might want to give DeWalt a try with their new Impact Ready line.